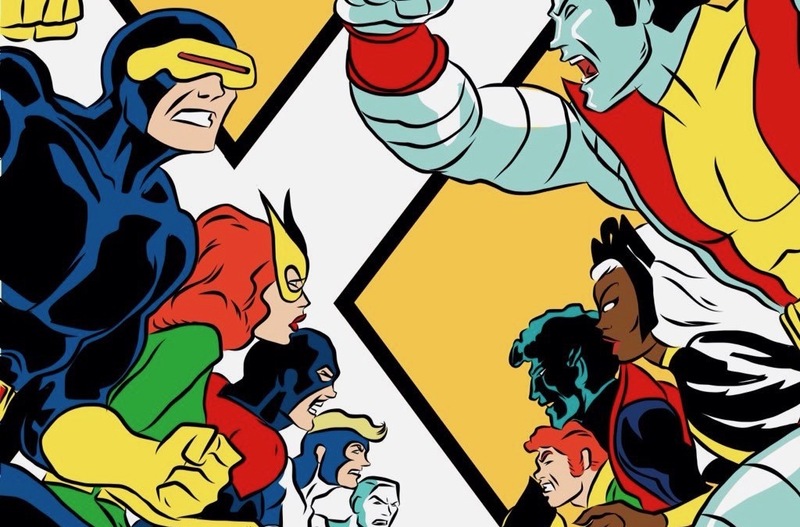 'X-Men Twitter' 101 with 'Battle of the Atom' podcast hosts Adam and Zack – AiPT! Adam and Zack of the “Battle of the Atom” podcast explain the ins and outs of “X-Men Twitter”! But… what exactly is “X-Men Twitter”? When did it start? Who are its major players? And how exactly does one go about becoming a part of it? For help answering these and other important questions, I turned to my friends and fellow X-Men fanatics Adam Reck and Zack Jenkins, who also happen to host the weekly Battle of the Atom podcast. AiPT! : So, Adam and Zack… what exactly is “X-Men Twitter”? Adam: A loosely linked batch of obsessed X-Men nuts who tweet constantly about X-Men, X-Characters, creative teams, etc. And by nuts, it’s not just fans–it’s also a fair share of creators, critics, podcasters and more. Zack: X-Men Twitter is an outlier in the comics community because it’s a super-positive place where people talk about X-Men. It isn’t anything formal, which I think is to its benefit. Unlike a forum or Facebook page or subreddit, X-Men Twitter is whatever you make of it. Sure, there are common touch points or influences, but you can tailor it to your specific tastes. AiPT! : From your perspective, when exactly did X-Men Twitter, in its current form, come into existence? Adam: I think you could make a fair case that it started to form when Jay & Miles started doing X-Plain the X-Men and fans used their website’s comment page to tackle all manner of X-related stuff. But I think it really started to become more tangible when [former X-Men Group Editor] Mark Paniccia started releasing teasers with the hashtag #XMenMonday. Now he’s passed that on to [current X-Men Group Editor] Jordan D. White, and there’s a lot of accessibility with editors and creators often doing spur-of-the-moment commute-home Q&As with fans. Zack: #XMenMonday really formalized what we are talking about. It gave fans a legitimate and approachable forum to interact with both creators and each other. You got that feeling of exclusivity, that you had a sneak peek that no one else did. That merged pockets of fandom from places like X-Plain the X-Men, the CBR boards or other smaller communities into one bubble of mutant madness. AiPT! : What’s so uncanny (sorry) about X-Men Twitter? Adam: I mean, I’m not big into Avengers aside from the movies, but I don’t think there’s a huge Avengers Twitter community. X-Men fans are notoriously and historically difficult even back to early letters pages, so Twitter gives people who are crazy about X-Men a voice and a community I don’t see in other comics fandoms. Zack: Not just a community, but a positive one. This is a space that is friendly to diverse people and viewpoints. I have learned that every X-Man is someone’s favorite, and those fans can be very territorial. That means disagreements happen, but more often than not, they happen in respectful ways. With major media companies doing pieces about the toxic pockets of comics fandom, it is refreshing to know somewhere exists where that isn’t tolerated. AiPT! : You’ve mentioned a few key players, but what other individuals make up X-Men Twitter? Are there prominent figures who are viewed as its leaders? Adam: The X-Editor of the moment–in this case @cracksh0t–definitely is a hub because he’s teasing content and engaging fans in a really great way. Jay of Jay & Miles (@RaeBeta) is the respected resident X-pert. My buddy Zack (@Xavierfiles) always has the hottest takes. He and Charlie (@geneticghost) moderate the amazing X-Plain Discord server as well. Creators like Leah Williams (@mymonsterischic), Matthew Rosenberg (@AshcanPress), Kelly Thompson (@79SemiFinalist) and Ed Brisson (@edbrisson) are really willing to engage with fans and go deep in conversation about characters. An example of the fun that awaits you on X-Men Twitter! Zack: I want to emphasize the creators because I think they are the critical component here. The engagement that Mark Paniccia started, and Jordan White expanded, sets the stage for pockets to organically form. Other creators who deeply engage with fans, like Adam mentioned, form a great foundation. From there, I’d find out if one of your favorite X-related podcasters, cartoonists, bloggers or artists has a Twitter you can start following that they interact with. There is no one leader or leaders at all–just a bunch of passionate fans being excited by dudes with laser eyes and knife hands. Adam: Who your hub is depends greatly on which side of the X-Men Twitter-verse you are on. Which X-podcast is your favorite? Are you friends (either in real life or online) with the hosts? Are you digging for spoilers? Are you a character-obsessed cosplayer? Are you a fan art retweeter? There are accounts that focus on all of these if you look for them. And the vast majority are really nice people. AiPT! : What topics does X-Men Twitter seem most passionate about? Zack: Cyclops, Emma Frost, Magik, Adam-X the X-Treme, not Wolverine, whatever minor character that individual has imprinted on. The pockets I’m most engaged in are heavily focused around current comics. I know spheres for movie fans and people who know the X-Men in a more casual way. X-Men is a wide enough media empire that you can find your passion reflected in others anywhere. Adam: I know a dude who is ridiculously obsessed with Maggott–oh wait, that’s Zack. Zack: HEY! There does seem to be a general desire to promote enjoying these comics we read, either new ones that are coming out or your favorite era or arc from X-history. AiPT! : Aside from Maggott, is there anything else X-Men Twitter is a little too passionate about? Zack: All of them. X-Men fans have no chill. Adam: Every single person has a character, a ship or an era that they are obsessed with and will battle you and die for. AiPT! : If readers are interested in becoming a part of X-Men Twitter, what should they do? Zack: Practically? Just do it! Follow Jordan, follow the creators, follow the people who have the content you crave. Adam: Start following awesome fans and awesome creators and be part of the conversation. A few recommendations, though: Be kind and realize that this group is progressive and out to help the world just like the real X-Men. And make sure to credit where credit is due, especially with fan art or other creations. Zack: And make sure to remember, everyone is there because these dumb comics about weirdos and misfits have touched their lives and they just want to enjoy that with others. Embrace the excitement and don’t let negativity drag you down! AiPT! : Great advice! Thank you, both, for taking the time to educate us on the wild world of X-Men Twitter. Adam can be found on Twitter @arthurstacy, while pages and more information on his X-Men fan comic Bish & Jubez can be found on his tumblr. Zack’s daily thoughts on all things X-Men can be found on Twitter @XavierFiles, while X-Men articles, rankings and more can be found at his website XavierFiles.com.